Hi, I have been reading over a lot of reviews on the website and I have a particular interest in daggers. I was hoping that I would find some information on a particular type known as the Stiletto. 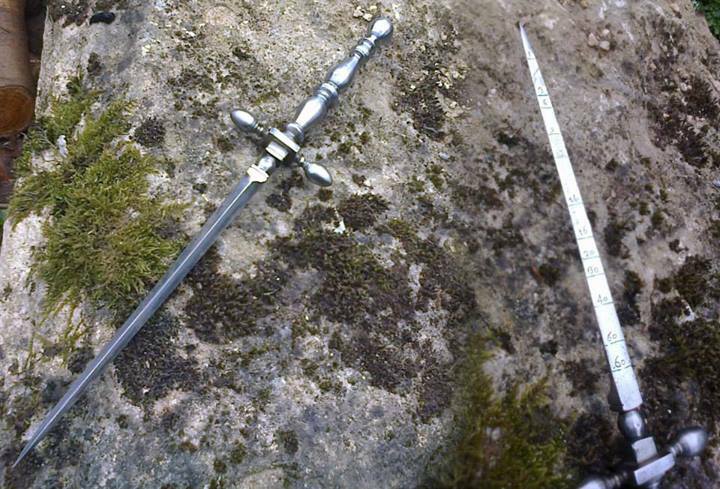 The closest I can find is the triangular bladed Rondel dagger, and they are very similar in in function, but typically a Stiletto would be smaller than a Rondel for easy concealment, as they were supposedly one of the favored weapons for assassins. I was wondering if any of you have any experience with Stiletto type daggers or if you could refer me to a blade smith who specializes in these types of blade. I prefer a weapon for functionality and quality over all else, and would like to find someone who could craft one of a high caliber. I look forward to hearing back from you, as well as any questions or suggestions you might have. There aren't really any makers who specialize in stiletto types of daggers, but there are several custom makers who could make (and have made) quality reproductions. The ones that come to mind are Tods Stuff and Arms & Armor. Lutel has some examples in their standard catalog of production pieces, too. you could do much, much worse than to look at Dr Fabrice Cognot - http://www.historicalbladesmith.com/ is his page (he also has a Facebook page too. ), and his workmanship is absolutely excellent. Fab has made stilettos in the past, particularly this lovely gunner's stiletto with gauge markings on the blade: If I were going to get such a piece made, it would be by him, without any hesitation. Not sure if I should revive this old thread or start a new one, but I am about to receive a stiletto repro in the coming weeks. 1. The actual markings. If it is solely bore size, then this will be rather straight forward, for extra fun, I could make it a treasure hunt and measure on extant gun barrels whenever I pass some on various trips. Just will have to read up a little on the period (I'm thinking 17th or 18th century artillery here) so it's conistent. But are there any other type of markings that can be found on these blades? I have done som basic googling so far, but do you guys have any litterature or other resources to recommend for me to read up on? If you add "-site:pinterest. *" to the end of a google search, you can exclude pinterest hits, that I personally find very annoying, since it is full of images where all trace of actual source is usually lost.